Like its companion work, this landscape verdure tapestry "Louis XV Hunting II" King Louis XV (1710-1744) of France, on a hunt in the countryside with his noblemen. A past time of the royalty of France and Europe in the 17th and 18th century, hunting involved the use of hounds and horses, which was as much about recreation of enjoying the countryside as it was about the hunt itself. King Louis XV was well known for reviving the development of art in France in the 18th century due to his love of art and commissions of works from his royal artists such as Francois Boucher and oversaw the production fo art and decorations for Versailles. Here we see King Louis XV and his men walking by a river in the forest in a scene which shows the variety of foliage colors from mauve to greens to olives. 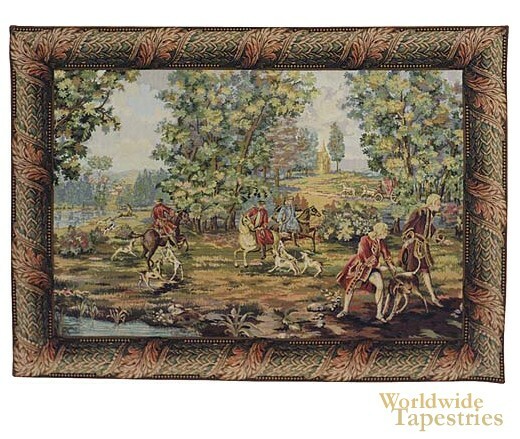 This landscape verdure tapestry "Louis XV Hunting II" is backed with a lining and has a tunnel for ease of hanging. Dimensions: W 80" x H 48"